Last year, FrequencyCast presenter Kelly was challenged by one of our listeners to find out more about amateur radio and attend a Foundation training course. Her co-presenter Pete is already fully licensed, and we’ve reported on his journey into the amateur radio hobby in previous shows. Pete already had some background in the fields of electronics and radio, so the entry-level ham radio course was pretty straightforward for our Pete… but what about Kelly. Could she cope with learning Ohm’s law, trying her hand at Morse code, connecting the various bits of equipment together, and learning the language used by radio hams around the world. And if she was able to make it through the practicals, what about the exam needed to get her radio licence? Foundation training courses are offered around the UK, and Kelly attended a course in Essex, called TARG, where Pete is one of the regular tutors. The course offered a mix of practical sessions, as well as presentations on the theory needed to pass the RCF Foundation exam. Years back, amateur radio exams included a Morse code test. 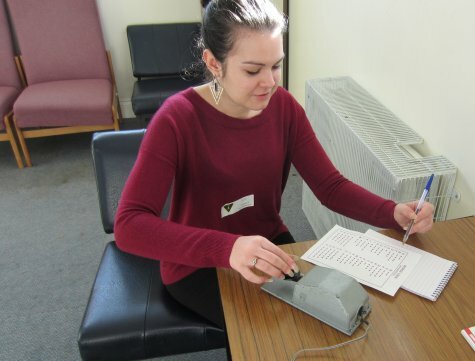 At Foundation level, it’s not required to learn Morse code, but one of the practicals offers an “appreciation” of Morse. Kelly seemed to take to this quite well (better than Pete did, we’re told!). Here’s Kelly “on the key” sending a short message. Two of the other practicals were also a breeze for our chatty presenter – talking on the radio. 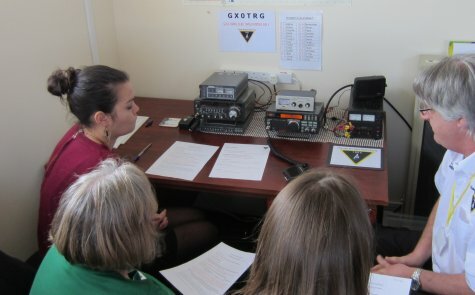 The syllabus requires that candidates complete a conversation on both the HF and the VHF bands, and her experience with FrequencyCast stood her in good stead. She’d done her homework on some of the lingo used by ham radio operators too, so the special terms and codes weren’t much of a problem either. The hard work, of course, was the learning. There’s a mix of formulas, transmitter theory, circuit diagrams, antenna theory, plus licence conditions… a lot to take in if you’re green to the subject matter. Find out how Kelly got on by watching our video montage. We’ll also be featuring her training in the next FrequencyCast show, due for release on the 1st of March. Any comments, or messages for Kelly… please add them in the box below. All this ‘Foundation’ and so on is news to me… been a while since I used 70cm or dabbled with packet radio and TV. Maybe I’ll have to find how I can get my old ‘G6’ licence back into use and might one day be able to have a chat with you, Kelly. Good luck with the course and exam(s). Hi Web Dude, One major change to UK Amateur Radio Licenses – no longer £15 per year, as long as you “validate” your license on Ofcom site. Once you’re registered with Ofcom, you only need to validate your license every 5 years. Validation is free, but you may need to make an initial phone call to get registered. 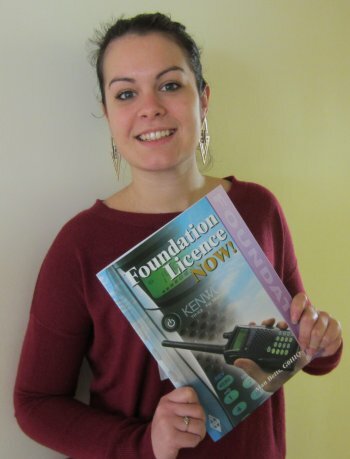 Congratulations to Kelly on achieving her Foundation Licence. It’s great to see more young people joining our hobby, keep up the good work. As a RSGB trainer, the best and only payment I get is the smile on the students face when they pass. Once again congratulations to Kelly from Martin (M1MRB/W9ICQ), Colin (M6BOY) and all of the team over at the ICQPODCAST.